﻿ Albert van der Sel : derivative function. In the series: Note 5. Subject: How to differentiate and determine the derivative function. This note: Note 5: How to differentiate and determine the derivative function. Please be sure that you are on a "level" at least equivalent to the contents up to, and including, note 4. 1. Introduction to the "derivative function". 1.1 taking the "Limit" of a function for a certain "x"
Before we go discussing "differentials" I need to touch on the subject of "taking the limit". This is really easy to understand. Professional mathematics can be very "formal" and can be quite hard to read, even if the subject is realtively easy. Suppose you have the well-behaved function f(x)=2x+3. Now, if you want to know the value of f(x), for say x=3, then you simply fill in "3" into "f(x)" and calculate "2x3 + 3 = 9"
Here, it is easily done, since "f(x)=3x+2" is a smooth continuous function (no gaps, no asymptotic behaviour). f(x) will ofcourse neatly approach 9, if "x" approaches "3". decsribe f(x) for that "x". Suppose we have the function "f(x)=1/x". This function behaves rather nicely, except when "x" approaches '0'. use it to illustrate something that is called "asymptotic behaviour". from a mathematical point of view. But, when "x" approaches "0", we run into problems, since mathematically, "1/0" is not defined. It's mathematically "not nice" to say: "f(0)", since division by zero is not defined (actually, it runs to infinity). 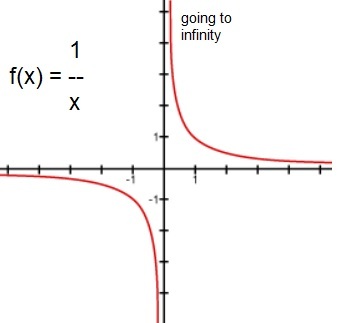 If x approaches '0' from the postive x-axis side, then "y" goes to + infinity. 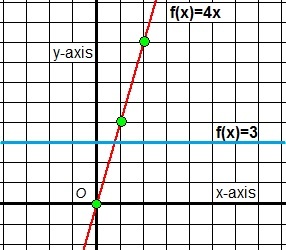 If x approaches '0' from the negative x-axis side, then "y" goes to - infinity. So, we are not saying "x" equals '0', but we say instead that "x" approaches '0'. But, for a nice, continuous functions, the "lim" notation simply means the value of f(x), for a certain x. We will mainly use this "normal" behaviour, instead of approaching "gaps" or asymptotes etc.. Since, if h really is extremely small, then "x+h" is practically the same as "x", and f(x + h) is practically the same as f(x). We have already seen some functions, for which holds that each "x" is mapped to one "y". Think for example of a linear equation, y=ax + b, where that condition is certainly true. But it's true too, for a quadratic equation like y=ax2 + bx + c, or, for polynomials in general. are no "gaps", and there (usually) is no "asymptotic behaviour" in the sense that the function very quickly "runs"
which shows such asymptotic behaviour when x gets near π/2. A function which does not have such irregularities, like gaps, is often characterized as "a continuous function". where the function "f(x)" then is the same as "x3 - x". Question: suppose we have the equation y=ax+b, then what would be f(x)? What could be called a "core" idea of taking the differential of a function? The text taking the differential already says a bit what we are looking for. the rate of change of "x". Or: we want to find the "ratio" of the change of "f(x)", to the change of "x". Does this give us extra information? Yes, it does. Take a look at figure 2 below. Case 1. We see a blue line, "f(x)=3", which is constant. No matter at which "x" you are, "y" will always be "3". Does this function posess any sort of "rate of change"? No. f(x) never changes so the rate of change=0. universal symbol for "delta", meaning "change". Δf(x) is "0". The line is constant, so there is no change at all. Case 2. We also see the red line "f(x)=4x". So, if you change "x" by one, the change of y will always be four times as large. Really. For example, if you are at x=0, and take 5 steps to the right, then you are at x=5 on the x-axis. However, y=f(5)=20. So, x changed by 5, and the value of y changed by 20. But you could also have considered a small change in "x". Suppose, on the x-axis, you are at x=1. Next, you go to x=1.1 (so the change is only "0.1"). The corresponding change in f(x) would then be "0.4". In this case (of f(x)=4x), you might decide that Δf(x)/Δx =4. No matter what change in "x" you would consider, then the corresponding change in "f(x)" is 4 times as large. You might say: alright, but wasn't it already "evident" in the function itself: y=4x ? True. I would like to re-write that a bit. A: If we would change "x" to "x+h", where "h" can be any value, then the change in x would be "h". That's evident. B: For the corresponding change in f(x), we can say that it has to be "f(x+h)" minus "f(x)". For the statement(B), we may not say that de difference in the function is "f(h)". Why not? Well, above we have only considered simple lines. But suppose the function is a parabola. In such a case, depending on where you are on the x-axis, the value of f(h) varies enormously. We always need to consider the change of x, with a truly corresponding change of f(x). and then change "x1" to "x1+h". thus with respect to that particular "x1". In considering the ratio of changes as we have seen in the examples above, does it add to our knowledge? With the actual functions (the lines) that we have seen sofar (y=3 and y=4x), the addition in knowledge is not really great. Ofcourse, when the ratio is "0", you can say that we thus deal with a line with a constant value. "changes" 4 times as fast as "x". But it gets more impressive if we consider more complicated function. Let's study a a good example in chapter 3. 1.3 The differential of a function, and the "derivative" function, of a function. I hope you can see the following reasoning, with the aid of figure 3.
we can draw a straight line between those two points on the curve of f(x). Note that this line is almost a "tangent-line', for that small neighborhood. Figure 3. Tangent line, if "h" gets small. which is very much the same as the gradient of f(x) for that local neighborhood. So, if "h" getting very, very small, we more and more end up with a true tangent line. We have "2x", since 2xh/h - h2/h = 2x -h, and, because h approaches '0', we thus end up with 2x. the derivation is valid for the whole of the "x-axis", thus for complete f(x). -So, if you want to know the gradient of the tangent line for, for example x=3, then that would be "6". Thus, the tangent line itself would be parallel g(x)=6x. -And, if you want to know the gradient of the tangent line for, for example x=5, then that would be "10". Thus, the tangent line itself would be parallel to g(x)=10x. -And, if you want to know the gradient of the tangent line for, for example x=8, then that would be "16". Thus, the tangent line itself would be parallel to g(x)=16x. Indeed, the slope is getting steeper if "x" increases, as expected with this parabola. In chapter 3 we will explore tangent lines further in detail. turned out to be g(x)=2x. This itself is just an ordinary function. Here I only use "f" and "g" to be able to explicitly distinguish both functions. But there already exists a way to denote both functions in a proper manner. Most mathematicians have agreed to use this. Please note the ' symbol, to denote the derivative function. Actually, often the "∂" symbol is used for functions having more than one variable, like f(x,y,x). For functions depending on just one variable, like f(x), simply the letter "d" is used, which then leads to the d/dx notation. Note that equation 3, is actually the "infinitesemal" variant of equation 1, where Δx goes to "dx". the corresponding change of "x" (also a delta), whereas the delta is assumed to approach zero. As said before, we will often use the "f '(x)" notation, to denote the derivative function. 2. Methods for finding the derivative function. Above we found that f '(x)=2x, is the derivative function for the parabola f(x)=x2. the derivative function. We have seen one example on how to do that, and really, all others go in a similar way. So, we are not going to prove the method on how to obtain the derivative function for all those type. And, it's really not neccessary. (1): Let's start with the simplest case: f(x)=c, or, what is the same, y=c, where "c" is some constant number. and it does not change at all if "x" changes. See figure 1 for an example of y=c. since the function is a line. Per definition, a line has a constant slope, isn't it? Yes, indeed! The coefficient "a" determines the "angle" of that line with the x-axis, or in other words: it's gradient. In a way, we may say that a line is it's "own tangent line". This means that the line 3x+2 has a gradient of "3", meaning that for each single step of "x", then "y" climbs 3 steps up. then "y" sinks 4 steps down. f(x) = axn (where a is some constant number). yes, this latter example we have derived ourselves in section 1.3. What we mean is this: suppose we have f(x) + g(x). Or if you like, suppose we have the function v(x) for which holds: v(x) = f(x) + g(x). Then how do we determine derivative function of v(x)? So, simply find the individual derivative function, of each part of the sum. So, we first have "v" operating on "x", then followed by "u" operating on "v(x)". So, we can interpret it as: u=v3, while v=x2-3. The sin(x) and cos(x) functions are very important in math and science in general. Thanks to subsection 6, we know what the derivatives of sin(x) and cos(x) are. But what are the derivatives of sinn(x) and cosn(x), where "n" is some power. For example, if n=2, we would have sin2(x) and cos2(x). In all this sort of tasks of finding the derivatives, the chain rule must be used. Suppose we want to find the derivative of y = cos2(x). Thus y = (cos(x))2 = f(g(x)). For the cos variant, the argument goes the same way as shown below. Let's consider the situation where we need to find the derivative of sin(x2). For higher powers, the method is exactly similar to the method below. We need to use the "chain rule" of subsection 5. Let f(u) = sin(u) and g(x) = x2. Thus y = sin(x2) = f(g(x)). [f(g(x))]' = cos(x2)(2x) = 2xcos(x2). If we have f(x), then usually (except at gaps, asymptotes etc..), we can determine f '(x), or the derivative function. However, in general, we can also determine the derivative function of that derivative function. I mean, you might also say that f '(x) is the first derivative function. But if f '(x) itself can be differentiated, then we may obtain the second derivative function f "(x) of f(x). Suppose f(x)= 2 x3 + 3x. We know that the first derivative is interpreted as the "gradient" (or slope) of the tangent line at f(x). The second derivative, may be interpreted as the "gradient" (or slope) of the tangent line at f '(x). What we have seen in this note is not the whole story, but for this note, it's quite enough. It's way better to let the material of this note "sink in", and try some examples by yourself. 4. How to analyze, or "investigate", a function. and "special points", like the "minima" and "maxima" of that function. to the x-axis, and it must be on a "hill" (maximum), or "crest" (minimum). Only at such point, the gradient (or slope) is then '0'. So: How to analyze a function? Please see note 6. The next note is a super quick intro in how to "analyze" a function.